It is a dark time in Camelot. (If that sounds familiar, perhaps you recently read this review of another Arthurian-themed traitor game) King Arthur has disappeared, and Mordred is pressing hard against his loyal servants. Unfortunately, Mordred is not waging an all-out war so much as infiltrating the ranks of Arthur’s people. Will the loyalists be able to root out the evil minions of Mordred in time, or will they fall prey to their cunning deception? Or, perhaps even worse, will they fail to protect Merlin, their only hope? In the Resistance: Avalon, an updated version of Don Eskridge’s The Resistance, players take on the role of characters in Arthurian times–either loyal servants of Arthur or minions of the evil Mordred. If you haven’t read our review of The Resistance, you should check it out right now. It’s one of our favorite games here at iSlaytheDragon. 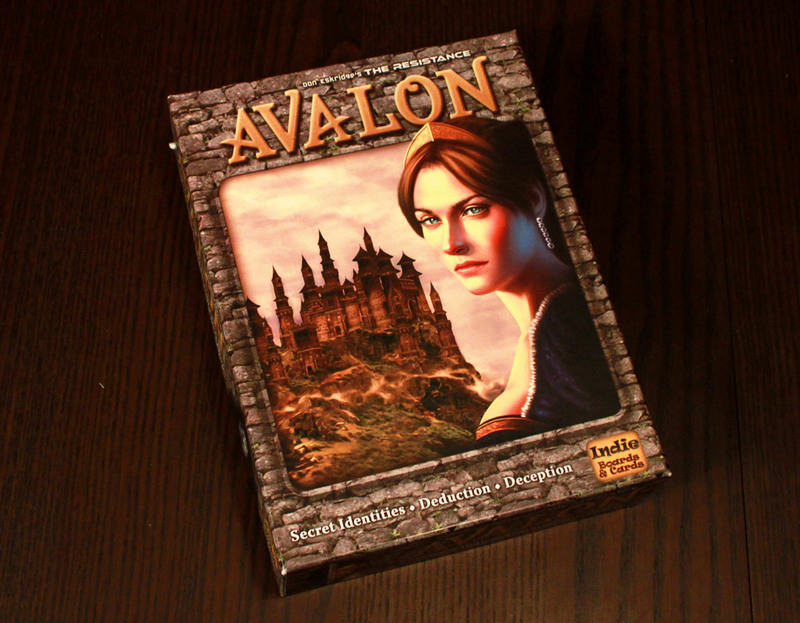 Avalon is a stand-alone expansion to The Resistance, and it plays much the same with a few twists. If you’ve never tried the Resistance, I recommend hitting up our review for a breakdown and a complete review of the game, but here’s the basic overview: there are 2 teams, in this case Loyalists and Minions. There are 5 quests, and each team is trying to swing 3 quests in their favor. However, the Minions are unknown to the Loyalists. Each round, a limited number of players are selected to undertake the Quest. 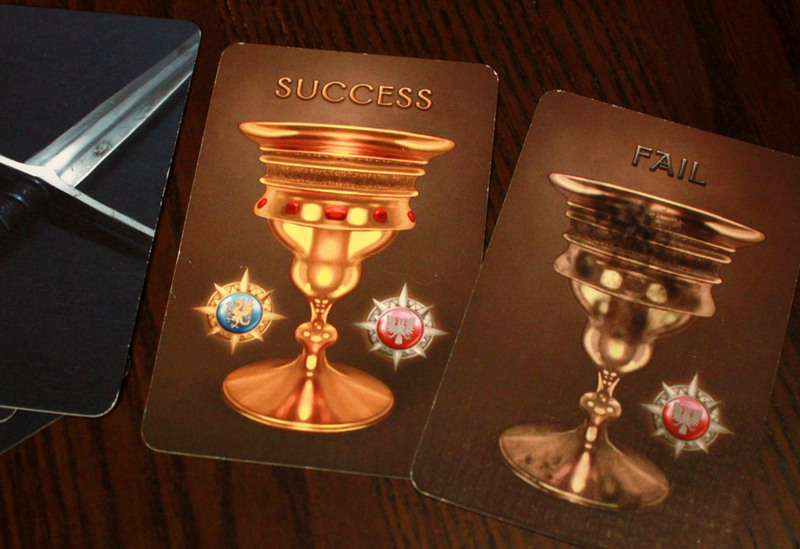 Those players choose a Success or Failure card, secretly play it on the Quest, and then all played cards are shuffled and revealed. A single Failure card means the Quest has failed (good for the Minions), but if all the cards are Successes, the Quest is completed (good for the Loyalists). Therefore, it is up to the Loyalists to determine who the Minions are so as to avoid including them on any Quest, while the Minions must deceive the Loyalists so they can infiltrate and play their Failure cards. There’s no logical solution though; the only way to figure out who is who is to question everyone, challenge votes and decisions, and to make accusations while attempting to read whether or not a person is lying. The core addition is Merlin, a Loyalist with the most important of knowledge: Merlin knows who all the Minions are. Pretty convenient, right? You’d think he’d just spout off the knowledge and zip zap zowie, Minions are toast. Except that with the addition of Merlin comes one other player role: the Assassin. If the Loyalists manage to complete 3 Quests successfully, they do not immediately win the game as in the original Resistance. Now, after these 3 quests, the Minions have one more chance. The Assassin may pick one Loyalist to assassinate. If he picks Merlin, all the effort was for naught, and the Minions win the game anyways. This means that Merlin has the difficult duty of somehow communicating his knowledge to the Loyalists, without being so obvious that the Assassin can pick him or her out of the crowd. The game also adds a few other roles which are optional; Percival, a Loyalist who gets to know who Merlin is and nothing else. Morgana, a Minion who appears as Merlin to Percival forcing him to choose which he thinks is the real Merlin. Mordred himself appears as a Minion who is not revealed to Merlin, and Oberon is a Minion who neither knows nor is known by the other Minions. The final addition, also optional, is a Lady of the Lake token. One player starts with this token, and after certain quests may give it to another player. If they do, they get to see if that player is a Loyalist or a Minion (but not their specific role). Like anything else, they are allowed to say what they saw (or lie about it), but not show. Of course now that player has the Lady of the Lake token to give to another player the next time. Does it complete its quest, or stab you in the back? I already knew that I loved the Resistance, so the question is do all these additions offer improvements, or do they just clutter up the system? The answer is, definite improvements. With a catch. I absolutely love the addition of Merlin and the Assassin. This simple feature does a wonderful balancing job and adds more exciting and interesting goals for all the players. In a smaller game with 5 players, where it was previously easy for the Loyalists to root out the Minions, Loyalists now have their work cut out for them to disguise Merlin to protect him. In a big game with 9-10 players, where the Loyalists had almost no chance of rooting out all the spies, Merlin offers a huge balancing factor, and while it is still necessary to protect him, there are more Loyalists to choose from and more chances to blend in. And Merlin does add more to do for everyone, surprising as it seems. And therein lies the catch. One of the things that is so great about the Resistance is how simple it is. The challenge of teaching a game to 7+ players at once is no small hill to climb, but the streamlined rules and highly interactive nature of the game make it a great choice for a group including gamers and non-gamers alike. It may take a round or two for people to really get the game and understand what their goal is and how to root out spies and all that, but after that everyone can participate and play. 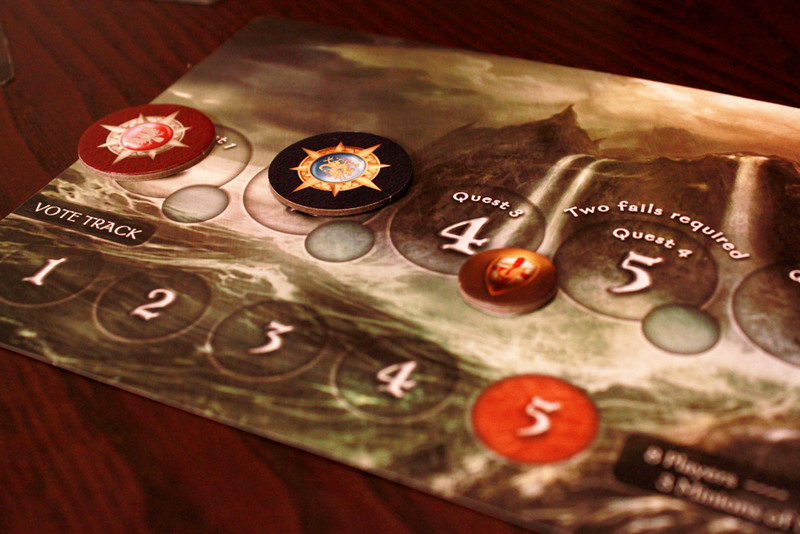 Merlin, while a huge balancing factor and a fun game-twisting addition, adds a surprising amount of complication. Not in the rules, just in what it takes to “get” the game. In the original, you just have to get that the Spies are lying to get on the team, and the Resistance members have to root out the spies by accusing and arguing and discussing. With Merlin, you have all that, PLUS the Loyalists need to figure out who Merlin is so they can follow his or her advice, PLUS they need to pretend like they are Merlin so as to disguise him, PLUS the Minions are trying to figure out who Merlin is. It’s a little confusing and overwhelming at first. Whereas the original game can be grasped in a round or two, it can take a GAME or two to understand Merlin. At first glance, Merlin seems like it turns the game into a trite guessing game. Sure, he helps the Loyalists out which is all well and good, but doesn’t that make it too easy for the Loyalists? And of course, the Assassin can seem a little lame at first glance as well. “So wait, after all these quests, the game is decided by someone picking between five players and if they guess right it all just goes away?” When you put it like that, it does sound like a step in the wrong direction. But if you put it in the right context, it all starts to make sense. If you think about it, the original game essentially boils down to “guessing the right players,” and if you get lucky, you win. But we all know the game is so much more than that. It’s about misdirection, accusing others, making others seem guilty, and trying to read who is lying. The same, when applied to Merlin, helps you realize that there is much more to this addition. Sure, Merlin has all the info he needs. But he has to be careful, and so while the Minions can feel trapped, they can always focus on figuring out who Merlin is. Tactics to delay the game, allow more discussion, and have more time to analyze can help save the day even if the Loyalists have settled on the correct team. Merlin is a tough role to play, with the pressure of sharing your information but not being detected, however the other Loyalists have a huge responsibility to act like they are Merlin. Protecting Merlin is a key part of the game, and if Loyalists consider that, the endgame Assassination is no longer a “random guess” but “how well did the Loyalists protect Merlin.” That’s much more interesting and it all falls into place. So yes, Merlin is a wonderful addition. It adds a huge balance factor and it adds more goals for players, more guidelines for behavior. It also adds just a little more complexity into the concept, if not the rules, that will take players at least a game, if not two or three, to really grasp. Fortunately, the games are still short, which means there is time for all those games. Still, for this reason, I recommend starting a group of new players with the basic game of Resistance. Also fortunately, the basic rules are still the same, so even if you only own Avalon, you can just ignore the roles and play the basics. The numbers are all the same. The only thing you don’t have is the Plot card mini-expansion, which quite frankly is totally unnecessary with the Avalon additions, and more complicated to explain than the roles. There are more roles in the box than just Merlin, but none of them as game-changing. They just add or remove information. They don’t feel as exciting as Merlin, but they can certainly add to the fun. I just don’t recommend throwing them all in at once. In fact, I would wait to add them in until you’ve played several games with just Merlin and the Assassin, because each role adds information that gives additional behavior options to players. Percival knows who Merlin his, making it much more possible for him to pretend to be Merlin to confuse the Minions. Morgana makes things more tricky for Percival, but she can pretend to be Merlin as well to throw off Percival and the Loyalists. Mordred adds uncertainty across the board by making Merlin’s knowledge incomplete. My least favorite is Oberon, which puts one player somewhat on their own. 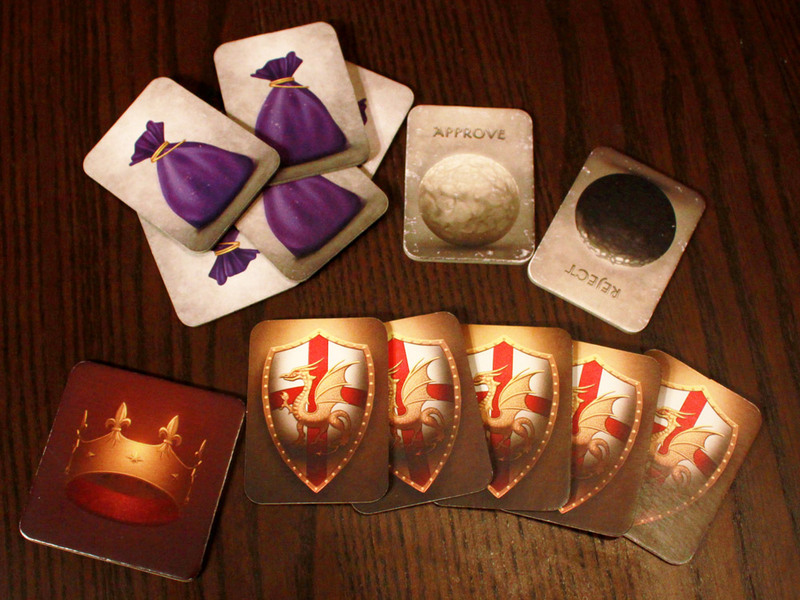 The components in Avalon are fine. Certain items from the original game have been changed from cards to tokens, which helps keep secret cards secret–I can’t tell you how many times in the original game players have accidentally passed in the wrong card, revealing their loyalty to everyone and forcing the game to start over. The graphic design is improved as well, making it easier to distinguish yes/no votes, loyalties, success and failure quest cards, and who the leader is. The biggest negative component change are the quest success/failure markers–from the colored wooden tokens to flatter cardboard disks, which are harder to see from a distance. But this isn’t a big deal at all. In conclusion, Avalon is a brilliant upgrade. While you don’t need both games, I would definitely recommend you consider replacing your original copy of The Resistance with Avalon, and if you don’t own The Resistance at all yet, I would say just get Avalon. You have all the components you need to play the original game simply by ignoring any roles, and the roles are more than enough to step the game up without the added complexity of the plot cards. iSlaytheDragon would like to thank Indie Boards & Cards for providing a review copy of The Resistance: Avalon. I find play times on ‘The Resistance’ at least can stretch upwards of an hour on occasion. Does Avalon take longer than The Resistance with your group? Yikes! Do you mind my asking how? The longest game I’ve ever played was 20 minutes. I think I’d measure my longest at about 30 minutes. I find that if a discussion is going around in pointless circles, it’s best to just call the vote rather than let the game drag. People can vote it down and then start a new conversation with the previous vote as added discussion content to move the game forward. The Resistance games I played, the first ones, lasted from 30min to 1h 30min. Discussion happens, revote cycles lead to analyzing approve/reject votes, more revote cycles, then all of a sudden someone gets totally shocked by whatever game event which forces him to rethink the entire earlier game. This used to be a staple at our bi-weekly after hours gaming at work. We typically had 9-10 players and took about 30 minutes. Downside for me is that with all the roles and the heads down thumbs up sharing of information, there’s always someone in the group who messes up and either reveals false info or doesn’t reveal when they should. It’s also hard to get started in a room when other games are going on too, since you need to listen carefully. I love the added roles as compared to classic resistance… as long as I and the other players actually revealed the correct info at setup time. I own resistance, but will definitely upgrade to Avalon at some point. Hi, may I ask if Oberon does reveal herself to Merlin?